Just like that, spring is approaching! Which means nice weather, and sunglasses, and putting away my puffer coat! And can also mean (if your life is this fabulous) berry pies, outdoor cheese and wine outings, and ice creams! So before it is fully underway, let’s take a moment to cleanse with this (delicious! and refreshing!) 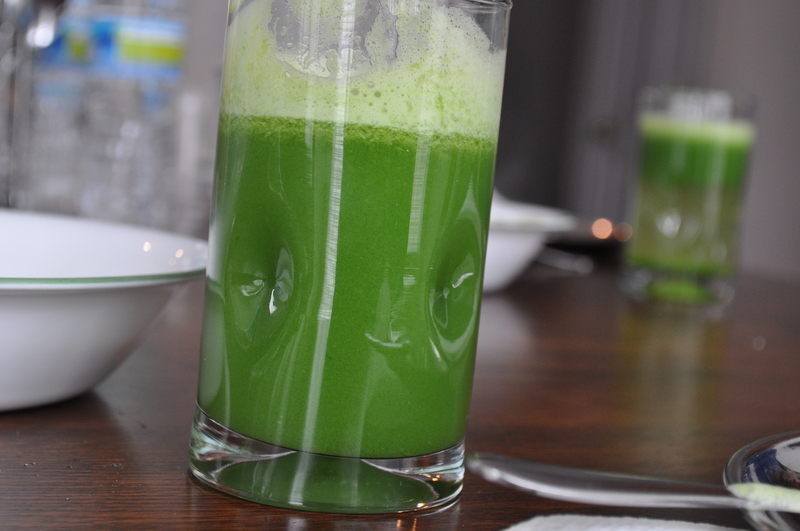 green juice. It has so many fruits and vegetables that it, too, is a practically a spring harvest in a glass! What better way to bring on the new season. You’ll need a juicer to make this. Which I, actually, do not have. This lovely glass of juice was courtesy of my mom’s fabulous kitchen. 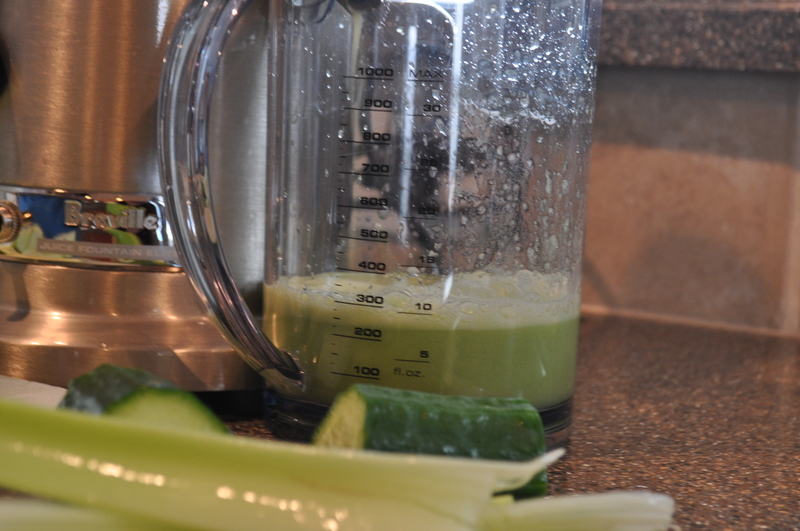 But you can, as I have, blend all of these things (except the celery) in a heavy duty blender. There is just more prep work involved. 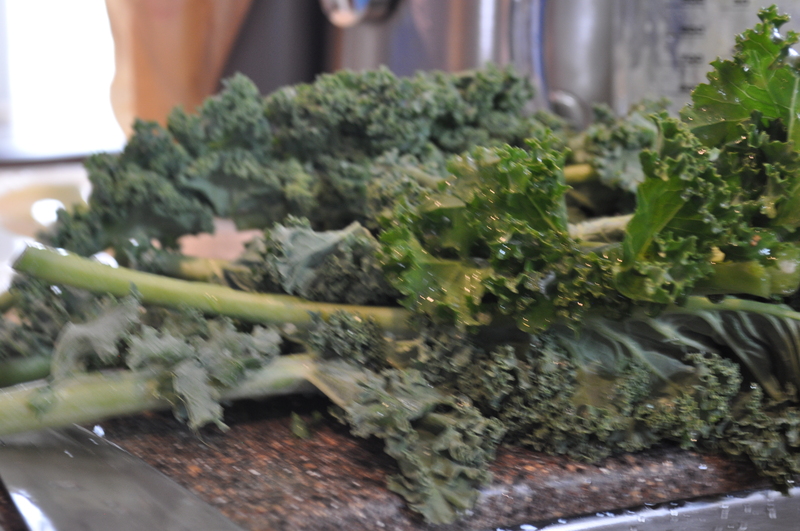 You will have to peel the apples, and dice them small, and cut the leaves off the kale stalks. 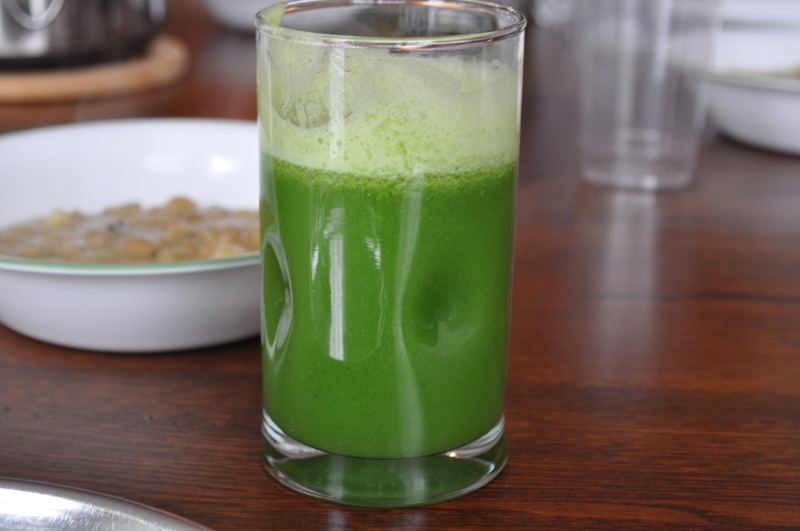 And you’ll have to juice the lemons into the blends first to give the leafy vegetables something to work with. And at the end, you’ll have to strain the whole thing to catch anything that did not liquify completely. But still completely yum! Juice everything in a juicer except for lemon. Squeeze lemons into juice. Stir and store in refrigerator to chill. Stir before drinking. Makes 4 very large, very healthy, salad-in-a-drink glasses. Or 5 normal sized, normally healthy glasses. I have always admired pop tarts from afar. They were always situated in my school’s vending machine, but I would never have enough cash and always have enough guilt to never make that purchase. But they were always on my mind. I would watch classmates eat them wondering if they really did taste better untoasted; why anyone would ever pick the unfrosted variety over the frosted; and most of all just wondering what these cookie and jam concoctions that called themselves “breakfast” really were!? And then one day, I put aside the guilt, raided my little piggy bank and tried one. And it all just came together. I discovered that toasted is better…as is frosted (obviously). But more than that, pop tarts are breakfast’s answer to pie! 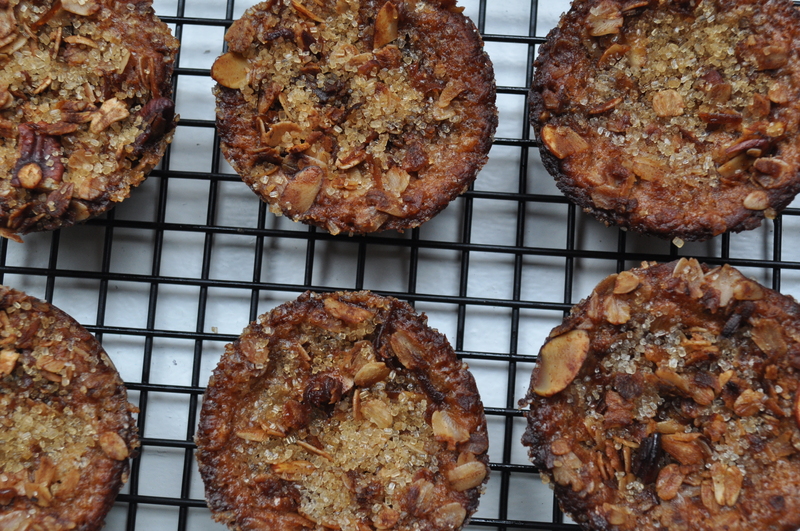 (Why else would they call themselves a tart?!) And after already having acceptable pie for an afternoon or evening savory meal, better known as quiche, there was a gap in the breakfast market. Yes, my 7th grade self put all of this together. It was brilliant (both me and the pop tarts). But as much as they want to be, they aren’t really pie, are they? They are stiffer and hand-held, and anything but flaky. So what better way to celebrate Pi Day (! 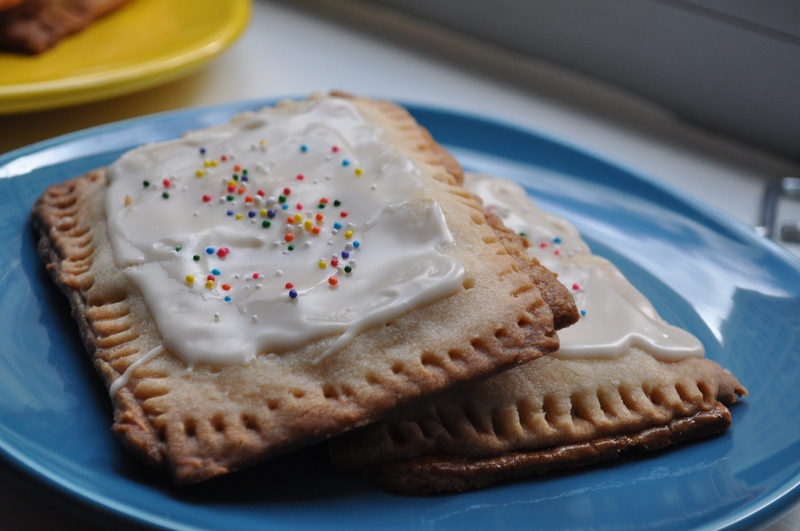 ), the best holiday of the month, than to make pop tarts how they were always meant to be. A homemade buttery version that still retains the crispness, jam and frosting of the original. No toasting necessary! Make the glaze green and you got the next March holiday covered too! A versatile treat, if you ask me. Cut the butter into the flour, along with the salt, until reduced to pea sized lumps. You can do this by hand, or with a food processor. Add the corn syrup all at once and stir together (or pulse on food processor) until a ball forms. Dust your hands with a little flour, scoop out the dough, and knead lightly until smooth. Flatten the dough into a square, divide it in half, wrap each in plastic, and chill in the refrigerator for at least an hour, up to 3 days. Take one of the chilled doughs, and on a floured surface, roll into a square, as best you can, until it is between 1/4th and 1/8th inch thick. Flour as needed. Using a pizza cutter or a sharp knife, cut into squares. I actually got a store-bought pop tart and used it as my guide to cut the dough, but you can always use a ruler or another benchmark. 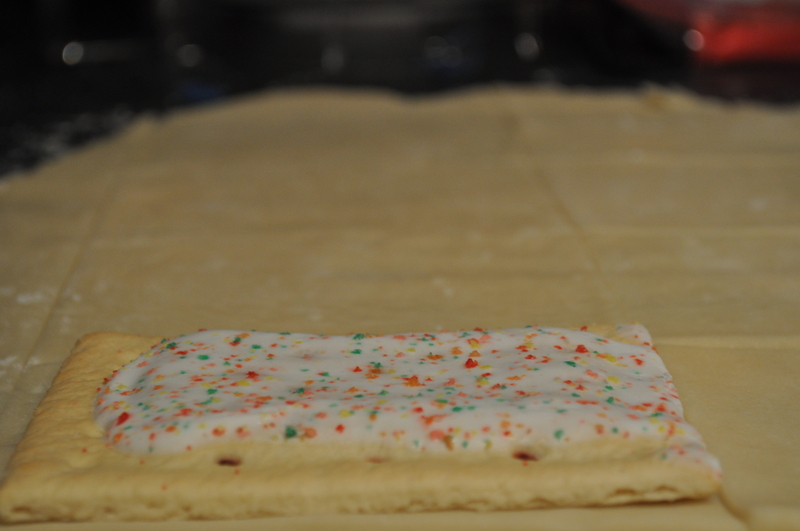 A real Pop-Tart measures exactly 3 1/8” by 4”. Transfer the squares to a parchment paper – lined baking sheet and chill in the refrigerator while rolling out the rest of the dough. Take half of the squares and place a tablespoon-full of the filling (recipe below) in the center. With a knife or your fingers, spread the filling throughout the square, leaving a tiny border. 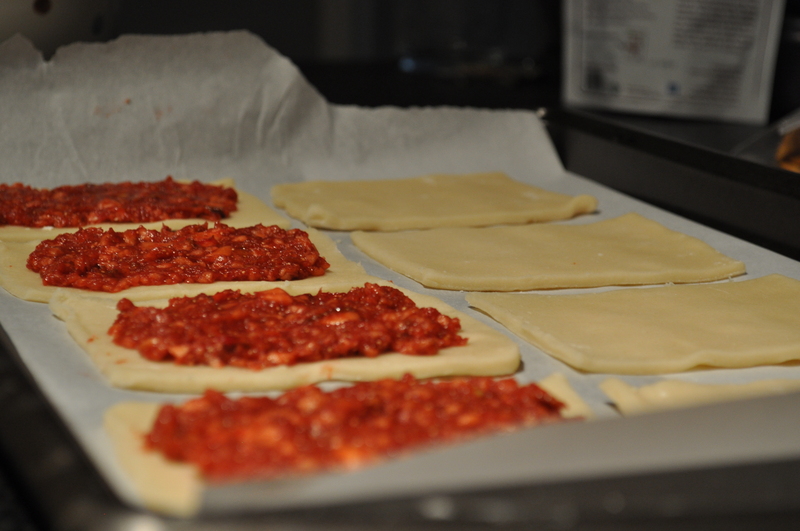 With a pastry brush, brush some water around the edges of each of these squares (so the top pastry layer can stick). Take the remaining squares and pierce them a few times with a fork. Lay gently on each of the filled squares and lightly press down around the edges. With a fork, press into the edges to seal. Bake for 25-30 minutes until golden brown. Let cool on the baking sheet and then transfer to a wire rack. Let cool completely. 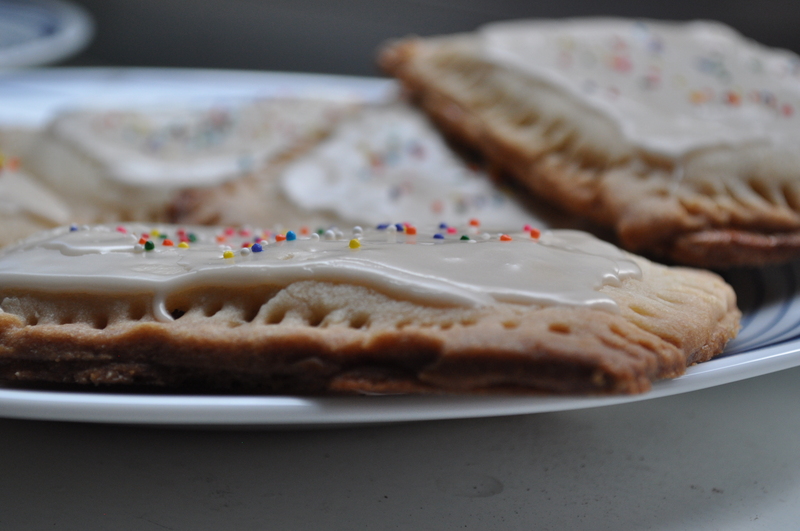 Brush a thin layer of glaze (recipe below) on each of the pop tarts. Let the glaze set for a couple minutes and scatter on the sprinkles. Cut the dried pears and apples into bite size pieces. Transfer everything to a food processor and pulse until everything comes together. Dump the contents into a small pot with 1 cup of water and mix over medium-high heat until the moisture has evaporated, and the mixture is soft and jam-like. Cool completely. Mix everything together until a smooth glaze forms. I always thought that I was one of those people who tries to put a twist on recipes to make them as healthy as possible. Can I use applesauce instead of butter? Bring it on! Will this recipe taste the same if I make it eggless? Why not?! Can we avoid the sugar altogether? Let’s give it a try! This is exactly what attracted me to this recipe. I wanted to make something healthy because, you know, it’s been one of those years…I mean, months…and this was the perfect wholesome recipe I was searching for. I mean, people, I had started making my morning oatmeal with water instead of milk, and a sprinkle of ground flaxseed instead of a tablespoon of peanut butter. It was necessary to find a tastier breakfast treat. But it still had whole grains, and unrefined sugars and was basically tugging at my inner healthy girl’s heartstrings. A perfect storm of a recipe, if you will. Turns out that the watered down oatmeal left something to be desired. The entire time I was making this virtuous recipe, I kept thinking, “why is there only a total of 1/4 cup of honey in this entire recipe? !” And that, my friends, was the beginning of the end. I looked at the rest of the recipe and decided that butter would be more delicious than tasteless oil, white flour would make this recipe lighter than its whole wheat counterpart, and heck, let’s just double the sugar. 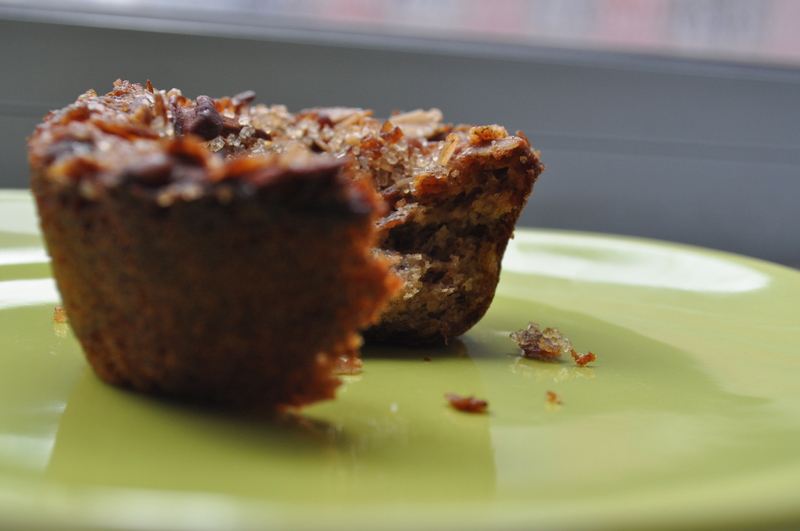 What resulted was a most delicious muffin with the most healthy sounding name. It made me believe that I was eating healthy! I hope it does the same for you. Don’t worry – if you would like to be better than me, I have put the actual recipe below, with my “adjustments” in parentheses. You can be good. You can be half good! You have options is what I’m saying. 1. Preheat the oven to 375ºF with a rack in the middle. Spray 12 muffin cups with cooking spray. 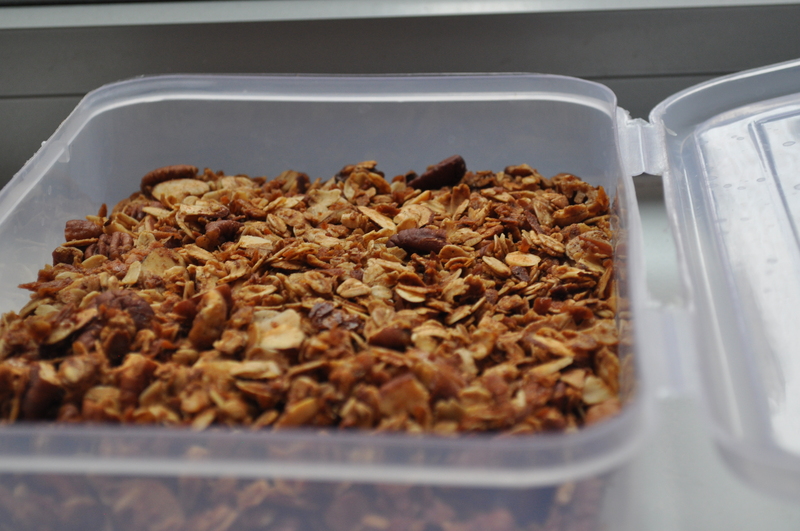 Combine the granola and milk in a bowl and let sit for 30 minutes. 2. Sift together whole wheat flour, baking powder, baking soda, and salt. 4. 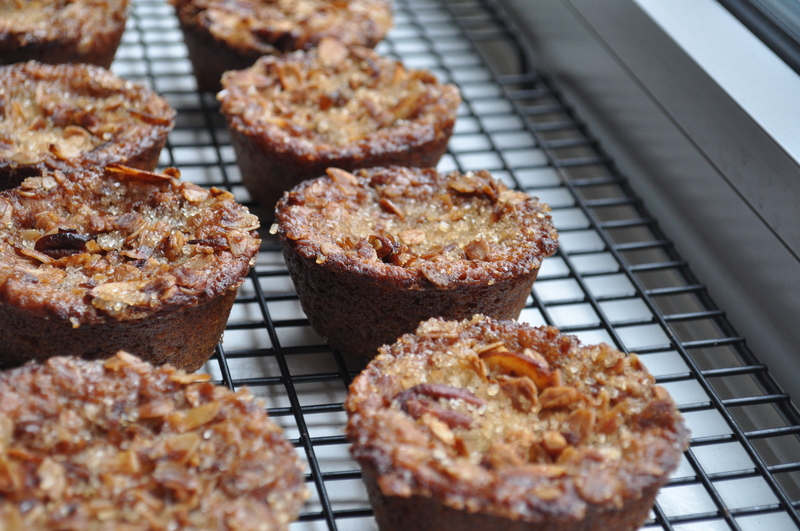 Spoon into muffin cups, filling each about 3/4 full. 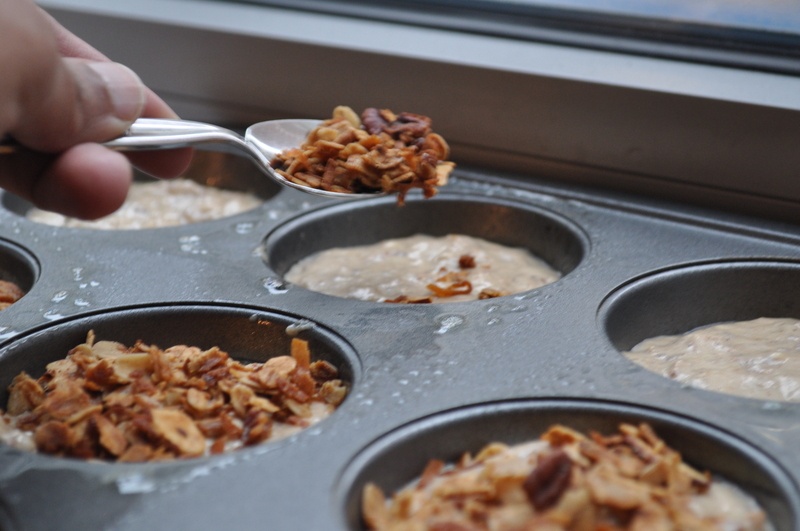 Sprinkle each muffin with extra granola and turbinado sugar. Bake 23 to 25 minutes, until lightly browned. Cool in the tins for 10 minutes, then unmold and cool on a wire rack. These muffins freeze really well.